These four spiral galaxies with bars of stars and gas slicing through them are at various distances from Earth. The galaxy at upper left is 2.1 billion light-years away; the galaxy at upper right, 3.8 billion light-years away; the galaxy at lower left, 5.3 billion light-years away; and the galaxy at lower right, 6.4 billion light-years away. Spiralgalaxies with bar-shaped arms may not have been born that way. Astronomers havefound that the number of bars has tripled in the past 7 billion years,indicating that spiral galaxies evolve as they age. Barredgalaxies are shaped like a tiger's eye, with twostarry arms trailing off either end of a long, dark stardust lane. Theytake shape as stellar orbits in a disk become unstable and deviate from acircular path. "Theformation of a bar may be the final important act in the evolution of a spiralgalaxy," said study leader Kartik Sheth of NASA's Spitzer Science Center at Caltech. "Galaxies are thought to build themselves up through mergerswith other galaxies. After settling down, the only other dramatic way forgalaxies to evolve is through the action of bars." More thantwo-thirds of spiral galaxies, including our own Milky Way, have a bar-shapedpath through their middles. 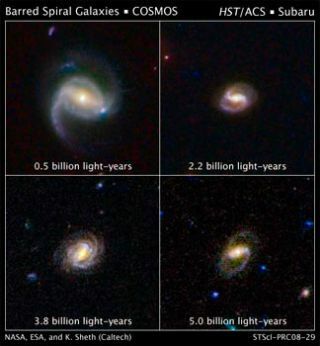 Accordingto new observations of over 2,000 spiral galaxies, made as a part of the Hubble Space Telescope'sCosmic Evolution Survey (COSMOS), the bar scene was dramatically differentseven billion years ago, when the universe was half as old as it is today. Theastronomers involved in the study, detailed in a recent issue of TheAstrophysical Journal, discovered that while spiral galaxies were around inthe distant past, only around 20 percent of them possessed the bars that are socommon in their modern counterparts. Thetripling rate does not proceed in a uniform way, either. "They are formingmostly in the small, low-mass galaxies," Sheth said, adding that among themost massive galaxies, the proportion of bars to no bars is the same as it istoday. "Weknow that evolution is generally faster for more massive galaxies ? they formtheir stars early and fast and then fade into red disks," Sheth explained. "Low-mass galaxies were also known to form more slowly, but now we seethat they also made their bars slower." Bars growin galaxies after stellar orbits in a spiral galaxy begin to deviate from acircular path, said survey team member Bruce Elmegreen, an astrophysicist withIBM's Research Division. "Itlocks more and more of these elongated orbits into place, making the bar evenstronger. Eventually a high fraction of the stars in the inner disk join thebar," Elmegreen added. Bars areperhaps the most important catalysts for changing a galaxy, Sheth said. Theyforce a large amount of gas towards the galactic center, fueling new starformation, building bulges ?spheres in the centers of galaxies made only ofstars ? and feeding massive black holes. "Theypull stars and gas out of their normal circular orbits into the centralregions, perhaps even funneling gas to the central supermassive blackhole," said Nicholas Scoville of Caltech and a COSMOS principalinvestigator. "Without this fueling, the black holes would be starved andthe central regions of galaxies devoid of young stars." The MilkyWay, possibly the best-known barred galaxy, is a massive one whose barprobably formed somewhat early, like the bars in other massive galaxies, Shethsuggests. "Understandinghow this occurred in the most distant galaxies will eventually shed light onhow it occurred here, in our own backyard," he adds.